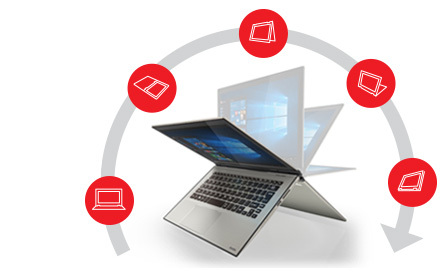 Toshiba Radius P20W-C-106 12.5 Ultra HD 4K Laptop Core i7-6500U, 8GB, 256GB SSD. The Satellite Radius 12 is designed to be your premium laptop when you need to achieve maximum productivity, and your comfortably-sized tablet when you need to unwind. Flip-and-fold convertible design allows the laptops screen to rotate 360 degrees, seamlessly switching between five modes, without interrupting your work. Head-turningly stylish with a gold brushed aluminium finish, the Satellite Radius 12's compact travel size enables you to enjoy supreme portability - weighing just 1.32 kg and measuring 15.4 mm thin, its the perfect companion for work and play. The Satellite Radius 12 is the worlds first 31.7 cm (12.5) convertible with an Ultra HD 4K IPS screen at 352 ppi, it offers four times the pixels of a Full HD screen with a resolution of 3840 x 2160, for four times the clarity. 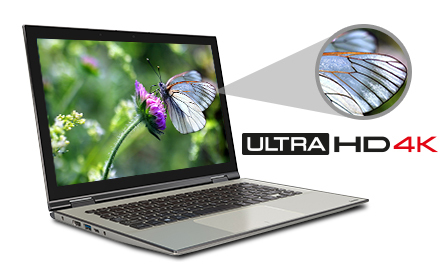 The display is colour calibrated and certified by Technicolor, along with Chroma Tune for Toshiba software, which allows the user to select the best colour space for the content theyre viewing. The Satellite Radius 12 is also available at Full HD 1080p IPS resolution, and whichever display you choose, itll be protected from scratches and damage by Gorilla® Glass NBT. Whats more, every detail is made more vivid by 350 NIT brightness even in high ambient or outdoor lighting conditions. The Satellite Radius P20W-C is pre-installed with Windows 10, and optimised for its new features. That means you can take advantage of several intuitive new features, including the new Continuum feature which detects whether you're using touch or keyboard functionality, and switches apps and content seamlessly between the two modes.